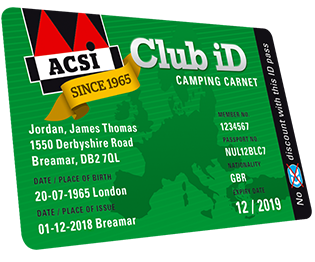 ACSI Club ID is the Camping Carnet for Europe! It offers plenty of advantages. You will no longer need to hand in your passport at the thousands of camp sites that accept the ACSI Club ID. You are automatically insured against liability, for up to 11 people. You can recognise the campsites on this website that accept CampingCard ACSI and the ACSI Club ID by this icon. It is also shown next to the relevant campsites in the guide. If you only want to stay at campsites that accept the ACSI Club ID, search under Facilities and tick on ACSI Club ID. You will find more information on our special website.